A friend of my father's brought me his laptop and said he was receiving compatibility problems when he uses his laptop. He left me the laptop and I opened a can of worms. First, I saw it was running Windows 8. Should have stopped there. Noticed that none of his network adapters were working and a few other minor issues. I got his Ethernet working and let it run some updates. After a few, his wireless started working, thinking we are making some head way. Then came the Free Upgrade to Windows 8.1. Ran it and more problems arose. Now I am getting the message that product key no longer works. Bummer. Tried all the Generic keys that I could find. Been sitting on hole with Microsoft for an hour and no love and I found this site. Other than throwing the laptop away and buying new or purchasing a Windows 10 license key, foes any one have a solution? After this fix does anyone have a solution on how to show a 90 year old man how to use Windows 8.1? 1, First solve out all the Laptop peripheral devices problem. PC Control Panel, Device Manager. Is there any peripheral devices get yellow exclamation mark? Solve that out first. Google: Malwarebytes, only use free version,download and install, click scan, delete any trojan find. 2, And check the laptop model, does it compatible use Windows 10? 3, Come back here and show you what to do then. 4, For your 90 years father, it is more easy to use Windows 8.1 than Window 10. 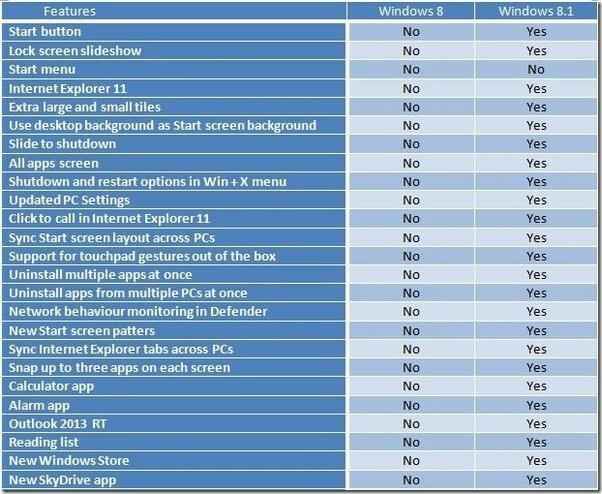 The above picture, show the different between Windows 8 and Windows 8.1. Windows 8.1 just get back some old feature missing in Windows 8. It will more easy for your father get use to it. Fixed my 8.1 activation problem thanks to this site, a couple of weeks ago. My 8.1 looks like Windows 7 as I don't like (or have) tablet form. If your PC or Laptop compatible to use Windows 10 , better use Windows 10. See the above post, you even can make Windows 10 look like Windows 7, have fun.